Unroll and remove paper from Betty Crocker Fruit Roll-Ups snacks. Using 1 1/2-inch heart-shaped cookie cutter, cut out 66 small heart shapes. Heat oven to 375°F. Spray baking sheet with cooking spray, or line with cooking parchment paper. In medium bowl, mix cookie mix, butter, flour and egg until soft dough forms. On lightly floured surface, roll dough 1/4 inch thick. 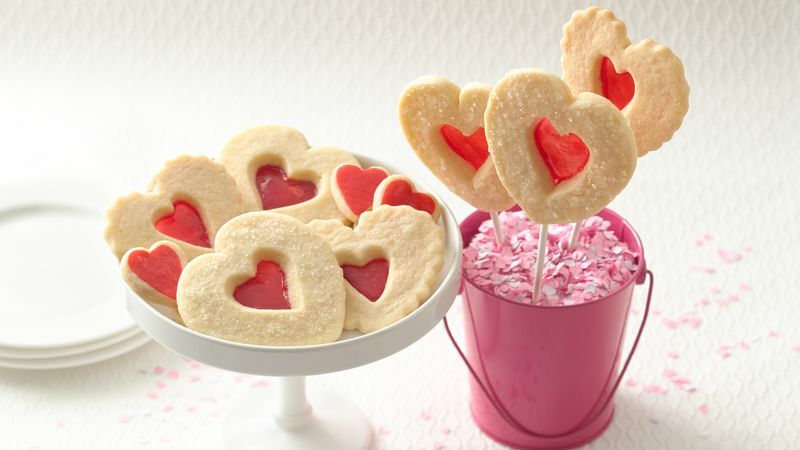 Using 3-inch heart-shaped cookie cutter, cut out 22 large heart shapes. Using 1 1/2-inch heart-shaped cookie cutter, cut centre out of each large heart. Place the 22 small heart-shaped cookies on baking sheet. Brush cookies lightly with water. Place 1 heart-shaped fruit snack cutout on each small cookie. Use small amount of water to "glue" 2 heart-shaped fruit snack cutouts together to make a double layer. Place on baking sheet. Place large heart-shaped cookie with centre removed on top of double layer of fruit snack hearts. Repeat with remaining fruit snacks and large heart cookies. Bake 7 to 9 minutes or until edges are light golden brown. Cool completely. Nutrition is estimated based on partial portion of fruit flavoured snack products used.